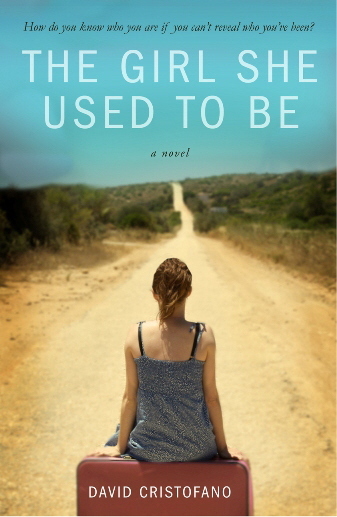 I liked the girl she used to be by David Cristofano; and to go a bit further, this is one of the better “first novels” I’ve read in a long time. Cristofano attempts to answer questions surrounding identity by introducing two characters who are damned to live lonely lives because of the identity of their respective parents. The main character is Melody Grace McCartney, who at the young age of six, witnessed a member of the Mafia murder a man at her favorite Italian restaurant. Her family was put into the Witness Protection Program after an anonymous tip to the Feds that they were at the scene of a murder. For twenty years, she’d been in the program and we meet her in the very beginning of the novel as one of her aliases – a school teacher in a small, boring town. Her parents were eventually killed by “the family” and there’s also a hit still on her life apparently. Enter Jonathan (aka, Johnny or Little Johnny). Jonathan is a little bit older than Melody…and just happens to be the son of the guy who killed the man in the restaurant…and just happens to be the anonymous tip that led to her family being put in Witness Protection. He is also the family blacksheep in that he hasn’t committed murder and in fact was supposed to be the one that killed Melody’s parents, but couldn’t do (his cousin was the one who pulled the trigger because he choked). The gist of the story is that figuring she has nothing to lose, Melody joins Jonathan in a strange plan to show his father/family that she isn’t a threat to the family. There’s running from the U.S. Marshals, as well as from the Family, and there’s some romantic interludes between two people who want a different life than what they have but really can’t ever be together. The story in and of itself is predictable and somewhat cliche (bordering on chick lit in some areas). That said, I thought the story was a good one to use in questioning the concept of one’s identity and what happens when you have no idea who you are because you’ve been yanked out of the life you started out living (several times). I thought the ending was excellent, except for the cliche wedding ring scene. I would have liked to see a bit less romance involved in the telling of the story – I believe the ending could have been achieved without having had all the romance. Jonathan could have just been someone who hated the family he was born into rather than having fallen for the target. There was no reason why it had to go into a romantic love thing just because he saw her innocence as a child prior to her world being turned inside out. In some ways, the romance cheapened the story and made her weaker than what I thought she was going to be. There were other ways to show the loneliness of the two characters without having to go the “I’ve fallen in love with my captor/captive” route. I really liked the concept that Melody was sick of the Witness Protection Program, didn’t feel safe knowing the U.S. Marshals were there to protect her (because her parents were in witness protection when they were killed), and so what did she have to lose by going with Jonathan – because ultimately if anyone could protect her from “the family” it would be someone from the family and mostly likely the safest person would have been the son who hated his family’s lifestyle. Adding romance between the two of them lessened the ‘I’m f-in over it! I want a real life!’ resolve that she appeared to have in some areas of the book. In fairness to the author though, he did try to show that love weakens not just the woman in this case but both a man and a woman. However, I think it would have been just as easy to have Jonathan a man of higher morals than the rest of his family rather than have him be the guy that couldn’t kill her because he loved her on some level that turned out to be romantic. Despite these things, the girl i used to be was an entertaining read. I really enjoyed the first paragraph where the author dared the reader to become involved in Melody’s story. This dare strategy worked, I read the book straight through and declared it a good book at the final word. I didn’t contemplate the romance being a bit too much in the story while I was reading it, and frankly, I do wonder how Melody has gotten on in her new life and what exactly happened to Jonathan. I also enjoyed the mathematical references throughout the book and the chapter titles were excellent. The usage of math throughout the book to give readers some insight into who Melody was/had become was interesting and somewhat fascinating as a technique to help understand where the logic was in Melody’s decisions. Additionally, the author did a good job telling the story from a female perspective. I suspect its extremely difficult for an author of one gender to get it right when writing from the other gender’s perspective. If you are looking for a bit of a mystery mixed with a little bit of romance and a splash of philosophical questions about what we want as human beings, then this book will be an enjoyable read. It also must be said, I am interested in seeing what comes next from Cristofano. I think there’s real potential here, and as I do with all new authors, I’m hoping he doesn’t get pigeonholed and continues to produces books with interesting concepts and ideas.